My brother-in-law in Sweden recently sent along this photo that he came across while going through some family papers. This is a photo of my in-laws wedding. It took place in Harissa, Lebanon in the summer residence of the Syrian Catholic patriarch, in 1949. 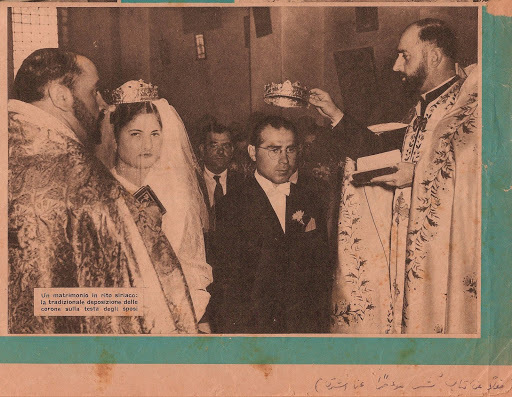 A wedding in the Syrian Rite: the traditional placement of the crowns on the heads of the spouses. From left to right, the photo depicts Msgr. Karroum (a relative of my mother-in-law), my in-laws Josephine and Georges, and Msgr. Mansourati, my husband’s uncle. The arabic text at the lower corner are notes made by Mgr. Mansourati indicating that the photo came from his book.